It was 20 years ago exactly since we first visited the north, north-west and southern regions of Tasmania,and as we had yet to explore the east coast and its many wonders, that led onto becoming our next holiday destination. Initially, we had considered going over on the Spirit of Tasmania and take the car, however, on doing the sums and realizing we would be losing a day each way, the decision to fly over and hire a car was a good one. Wanting to ensure not to risk missing our flight on departure day, considerable extra time was allowed as major road works were underway between the ring road turn off and the Tullamarine freeway leading to the airport. Well, you wouldn’t believe it, we had an uninterrupted and swift drive all the way from home to the long-term parking, found a car park almost at the entrance, the shuttle bus arrived within three minutes and the passage through check in went as smooth as one could wish for. Without a doubt, of all the traveling by air we have done, I was delighted how good fortune smiled on us all the way. Once on board, buckled up and taken off, there was just enough time for a quick cuppa before we were ready to land in Launceston. Oh, how nice it was to arrive in such a small, easy to navigate airport where collecting our baggage, collecting the car and on our way to Bicheno that was about two and a half hours away through a beautiful meandering mountain range all on first class roads. Below is a view of the beautiful beach on the approach side of town. From both inside and outside the cabin we had magnificent views of the Douglas River, the beach and endless countryside where sheep grazed. Within walking distance, the property extended down to the ocean where the sand was soft and white and also it was possible to walk for hours through bush and grazing lands. The tee-pee shape/s in the photo below were scattered along the foreshore and built by children from driftwood that had been washed ashore. There were two days that were overcast and on one of those we headed north up to the Bay of Fires,mistakenly I had believed its name had arisen from the color of the Lichen on the rocks, but in actual fact it was named by an early explorer observing the many fires lit by the native population of a night cooking their meals. Not far out of Bicheno one of its highlights was the Blowhole, an event that occurred when every wave came into shore rising up through a natural phenomena. A very popular spot for the tourists. The Mountains below are at Coles Bay and needed to be climbed to see the bay, and, if you were to continue on further up the walking track eventually you would reach the Wineglass Bay lookout. After a (grueling) hour plus trekking ,the magnificent view of Wineglass Bay could be enjoyed. Whaler’s Hill located nearby Bicheno was a short and enjoyable climb up to the towns highest point where Whalers of old would look out to sea for the water spouts of whales. An industry that took whales almost to annihilation. Easy walk to the top. Another day we journeyed south down to the town of Swansea,a very old pioneer town with an array of historical buildings. The Swansea School house (below) now converted into a town museum and information centre. Well worth a look for its historical information,old original class room and tribute to its soldiers that were lost in the great war. And, finally a lovely night out in town at the Seafood Restaurant over looking Bicheno Bay to celebrate our 20th wedding anniversary. Our souvenir tea cozy from Bicheno! July 2017 and finally a destination we have longed to visit for quite a while! On arrival in Broome, from cold and wet Melbourne the days gave way to beautiful, warm, sunny days averaging 30* every day, giving the old pins to once again adorn shorts and soak up the sun. Our accommodation was the “Bali Hai Resort” that gave the feeling of being on a holiday in Asia, with the rooms, decor, buildings, garden layout and atmosphere all allowing relaxation to kick in within minutes of arrival. This particular holiday we decided not to rent a car, and instead, do lots of walking each day to discover the town and its surroundings utilizing the magnificent and very reasonably priced town bus service. It was our desire to experience as much as possible during our stay, the only downside of the trip was mainly due to ocean tidal changes, and, one only bus service connection to “Gantheaume Point” first thing in the morning, the opportunity to see and stand in the 130 million-year-old Dinosaur footprints was to hopefully see them at any future visit we may embark upon. Some of the outings we experienced included attending the huge local “Court House” markets set amongst tropical frangipani trees in full flower, displays of local produce, local entertainment performers, various stalls on yummy smelling food outlets and trash and treasure of all varieties,from there a stroll into town to visit the “Pearl Luggers” outlet reflected many of the origins of Broome’s primary pearling industry. On three separate occasions we visited Chinatown in the heart of Broome and enjoyed the towns unique multicultural character, the vast amount of outlets where pearls/jewellery could be inspected and purchased, and indeed the wonderful variety of eating establishments, all having both indoor and outdoor dining on the footpath where the sunshine and fresh air could be enjoyed. A point of historical interest was that 75 years ago the Broome airport was the target of a Japanese air raid resulting in a high cost of 70 lives being lost and the destruction of a fleet of flying boats that were enclosed in nearby “Roebuck Bay”. Our resort was about a five-minute walk to the magnificent 20 kilometers plus length of Cable Beach to view the evening sunset. The villa was fully self-contained amongst beautifully manicured gardens, we additionally had a secluded outdoor dining area and also a secluded outdoor shower for use on hot days. Another highlight was the “Astronomy lecture and star viewing night’; we were collected from our accommodation in a huge 4WD vehicle, and driven about an hour out into the hinterland where a large area of scrub had been cleared for seating about 100 people on fold up chairs and 10 big telescopes pointed out into deep space. The lecture on the universe went for a very informative hour followed by the viewing of the night sky. The absolute experience that we both thoroughly enjoyed was a 10.5 hour day adventure, that is truly a natural wonder of our world.The Horizontal Falls are only accessible by either boat, helicopter or sea plane. We were collected at 5:30 am in a 4WD that took us to the Beagle Bay Mission where a welcome stop for a cuppa and biscuits was enjoyed. At this mission is the Beagle Bay church that had the altar and backdrop made from a collection of Mother of Pearl shells that gave a unique and interesting look. On the road again our next stop was “Cygnet Bay” pearl farm where breakfast was waiting for us prior to going on a tour through the establishment, a history of pearling and a demonstration of pearl seeding was given. All fed and watered, we next boarded the 4WD again and headed to a small private tarmac,where we climbed aboard a combined land/seaplane for a half hour flight over the Buccaneer Archipelago consisting of in excess of 2000 small islands situated in the most beautiful blue/aqua colored waters to our destination of “Talbot Bay”. We smoothly landed on the water and taxied to the “Horizontal Falls Pontoon” to have a wonderful Barramundi lunch and refreshments and also if one was game enough have a swim with the sharks. Finally the most exciting part of the day trip was when we boarded a 900hp very fast Jet Stream boat (The fastest in all the Kimberley) that took us through the most thrilling ride into the horizontal falls (6x) and then to let the adrenaline subside a cruise around the surrounding creeks and bays prior to returning to the pontoon and boarding the Seaplane. This was a direct flight back to Broome airport and on arrival to be delivered back to our accommodation. Wow, what a great holiday and new experiences to tick off the bucket list. “A short trip to “Pennyroyal”. Early March 2017 was when we headed off for a few days break at “Pennyroyal“, which is in the vicinity of the very small township of “Deans Marsh” roughly located between Lorne and Birragurra, Victoria. Why Deans Marsh? well my eldest sister and her family lived in this isolated region back in 1957 and it consisted of very little more than a sawmill, a store and houses occupied by the sawmill employees and it was a place where I would spend many an Easter, school holidays or Christmas with my young niece and nephew and enjoy the tranquility of the outback bush countryside. Memories abound of swimming in the waterhole beneath a bridge, going rabbiting, chopping starting wood chips for the massive IXL cast iron stove that burned constantly as it also heated the hot water and the wonderful smells of fresh air and the wood fire. Not having been in this region for such a long time and having many vivid and enjoyable times there in my youth, we booked a B&B cabin at Pennyroyal. Pennyroyal in itself is an insignificant place of bush and farmlands and not a town and is a five-minute drive from Deans Marsh. The place we stayed at was a fully kitted out cabin having magnificent views of the country side from the back verandah where we shared breakfast with so many different birds and their chorus every morning and at night viewed the abundance of heavenly stars above. This was not a sit back and relax get away for we wanted to explore and experience as much as time permitted of the surrounding countryside. Our many journeys included visiting/driving through the” Otway Ranges” into Lorne for lunch and a nice stroll along the beach, and a trip out to “Forrest” another very small township in the hinterland of the Otways where we lunched at the “Forrest Brewing Company”,a small micro brewing enterprise brewing hand crafted beers. “Birragurra”, (another historic town of the region)is about a 20-minute drive from “Deans Marsh”, consisted of a very wide main street, shop fronts all of which were more than 100 years old and has an ambiance of utter slowness, peace, and quiet. Next day we continued our journey onto the vibrant city of “Colac” where we explored the magnificent Botanical Gardens and had lunch at the garden’s restaurant that over looked the impressive Lake Colac, a massive fresh water catchment area that supplied the township. As early afternoon approached, we first visited “Lake Cundare” salt lake then onto our next destination of “Red Rock Lookout“. That supplied us with a sturdy climb to the top and a reward of 360* of an uninterrupted vista of the many and varied craters left by volcanic activity from as little as 4000 years ago, after that a return to the cabin for a lovely home cooked meal and glass of wine. Looking down from Red Rock lookout. Whilst all of the above consisted of a lot of driving, it was well worth it as the experience was one you needed to personally appreciate what it offered!All in all, an enjoyable time. Canberra to Katoomba. Part 2. Part 2 of our trip. After having had such an enjoyable stay in Canberra it was now time to repack the car once again and get away early for our journey onto “Katoomba” which was a day of driving many kilometers. 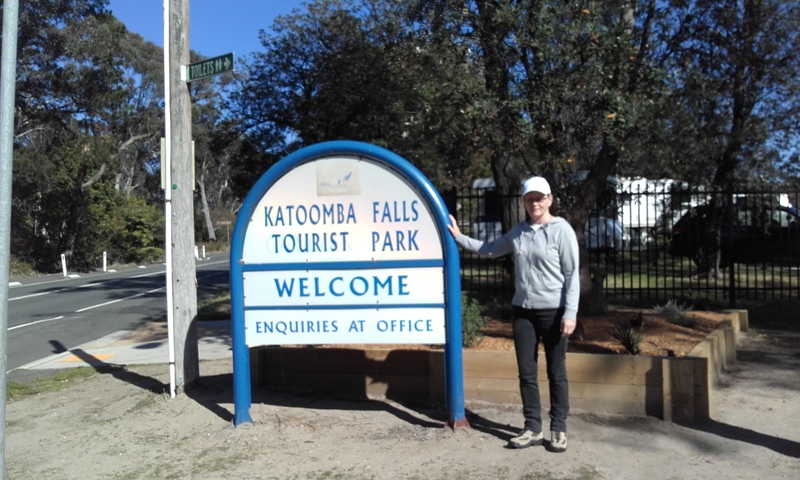 After an uneventful drive, we finally reached the Katoomba Falls Tourist Park where we were to stay whilst we explored the walks of the Blue Mountains and all it had to offer. The accommodation was first-class and in a beautiful quiet setting and not far from the commencement point to many of the walks. Whilst light was still on our side we ventured over to the “Furber Steps” that led us to the lookout point where the panorama of the mountains opened to us and surely lit our visual senses as we were in awe of its magnificence. For as far as one could see, mountain ranges, waterfalls,”Mount Jamison” and in the distance the main attraction “The three sisters” could be enjoyed and that set us up emotionally for the experiences we were to have in the coming days. From this location, the Scenic Skyway cable car could be seen crossing from one side of the escarpment across to the other. Dusk had now appeared so back to our cabin to settle in for some dinner and a nice bottle of wine in preparation for a cold 2* night and the following day’s upcoming adventures. Next morning, with backpacks on we, were off to “Echo Point” via the “Prince Henry’s Cliff” walk which was classified as moderate difficulty,had abundant views, birds abound, magnificent bushland and with the warm early morning sun shining it is but another of life’s experiences I will always treasure. Eventually, Echo Point was reached where a completely different perspective of the ranges opened up to us and it is also a location where a never-ending procession of tourist buses stopped to allow the passengers to take close up photos of the three sisters. As lunchtime had arrived we walked about 1/2 K to a restaurant located high on the precipice where we sat outside and enjoyed our lunch and soaked up the wonderful views, after that via another route through the back streets we ventured back to camp. Later that afternoon after our legs had stopped quivering our next trek was not far to the “Eaglehawk Lookout” where another splendid walk along a meandering pathway through the bush to the lookout where what we had seen on the morning’s walk showed the massive sheer cliffs that had broken away millions of years ago could be viewed from another angle. Next day back at Echo Point a pathway that led down three sets of exceptionally long/steep stairways (so steep that I’m sure the imprints of my hand’s are still on the railings).On reaching the bottom of these stairways a short wooden bridge allowed access to the first of the three sisters where even greater views of the valley could are enjoyed. Well, folks, that’s about it for a brief overview of only some of the highlights of our Katoomba-Blue mountains getaway. Next morning we fed the cockatoo’s on our balcony, repacked the car for a long journey down to Albury to stay overnight and return back to Bundoora the following morning and pick up the dog (Luckily he was still talking to me). All in all a fantastic time away from touring the highways, exploring the countryside and in particular coming off the main highway several times to have morning tea/lunch or afternoon tea in very old country towns. To Katoomba via Canberra. Part 1. 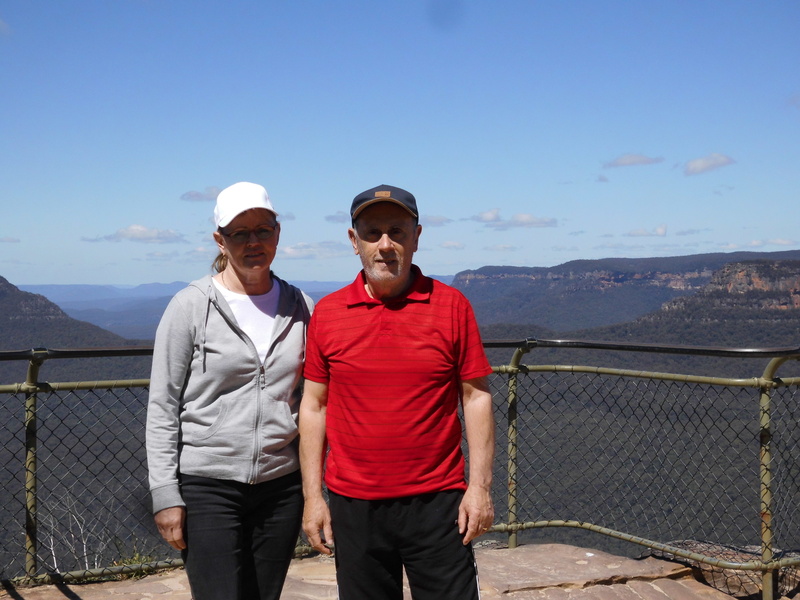 It was October 10th, 2016 and after dropping our dog off at the boarding kennels we were then heading off to do some trekking/bushwalking in the Blue Mountains at Katoomba, NSW with a stopover in Canberra for a few days before hand to see the local sights. It rained lightly off and on from Bundoora to Canberra however the journey was pleasant enough as the Hume highway was in first class condition and although there was flooding most everywhere near Albury the roads were not blocked so that was our gift for the day. We stopped a couple of times along the way for morning tea and lunch until we neared our destination where we were to stay for a few days whilst we explored in and around our capital city and surroundings. The one hiccup we encountered was that the address we were to stay at could not be located by our GPS causing us to drive past the spot by an extra 5 kilometres; on phoning the holiday park for directions they advised due to their location being on the service road that runs parallel to where their address says they are many people find their GPS cannot find the holiday park.Upon arriving and booking in and unloading our suitcases etc a cuppa and a short nap was the order of the day followed later on by a visit to the local country pub for a nice meal. 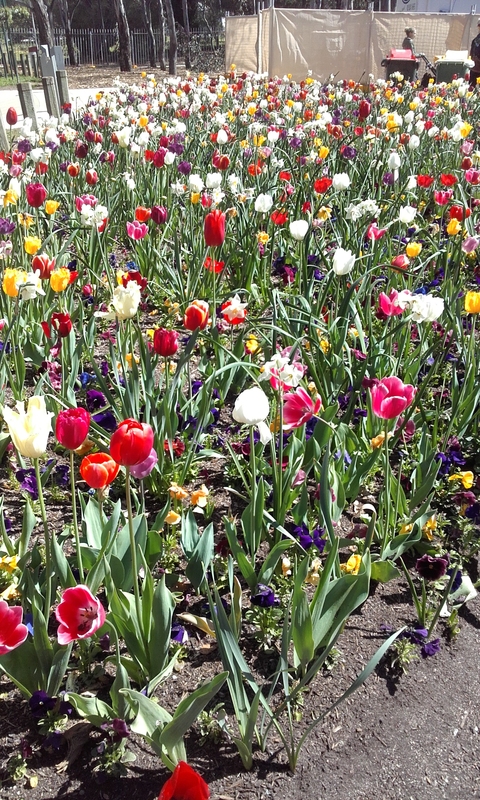 Our timing at Canberra was perfect as the Floriade Tulip exhibition (Blooms beyond the garden bed) was on so off to the display to enjoy the color and sunshine. Our next port of call was Parliament House where we viewed the magnificent exterior of the building,the incredible marble entrance foyer, both the Upper and Lower houses,the portraits of all Australia’s past Prime Ministers as well as taking the elevator to the roof to where the biggest Flagpole I have ever seen proudly displayed our country’s flag. From the vantage point atop the Parliamentary rooftop, a clear and uninterrupted view bordered by an avenue of trees, all the way up to the Australian War Museum was a sight to behold . The War Museum was next on the agenda to visit and the feeling of walking through the main entrance to see the memorial pool left a sensation of being in a sacred place. The tour guide was excellent and shared many stories of horrific circumstances and heroism of both our men and women who suffered greatly during the first and second world war,Korea, and Vietnam and reinforced how much we owe to those that fought,sacrificed and died for the freedom we so enjoy now! Several of the battles were displayed in what is called a Diorama which is a scaled down pictorial version of fighting taken from photographs of that time and made into model form approximately six meters long . As time was still on our side the National Museum of Australia was next on our list so once again off we went and spent a couple of hours there enjoying old and new Australiana plus an excellent exhibition of Egyptian artifacts on loan from the London museum. Day three of our stay and off we head to the summit of Black Mountain where the goliath “Telstra“transmission tower is located.It stands over 192 meters in height has 360* views from the restaurant located 62 meters above ground and has views of Canberra and countryside that takes one’s breath away. That afternoon after setting the GPS our next destination was the “Australian Coin Mint.”The mint was very interesting and showcased a historical collection of metal currencies from early settler times up to the present age. A complete story of coin manufacture from sourcing materials,weighing,coin design, punching coin blanks through to the final pressing of the coin was explained and very interesting. Late afternoon soon arrived which gave us just enough time to visit the “Australian Natural Botanic Garden” that enabled us to tour the “Eucalyptus Discovery Walk“where a huge variety of gums consisting of twenty different species were punctuated throughout a 1.8 kilometer walk that also included a rainforest,gullies of ferns,red desert display and many other features that took over an hour to enjoy. In conclusion, it is a must if you have never been to Canberra before as it would have to be amongst one of the neatest ,well designed,treed and gardened place I have encountered,be sure not to miss it. 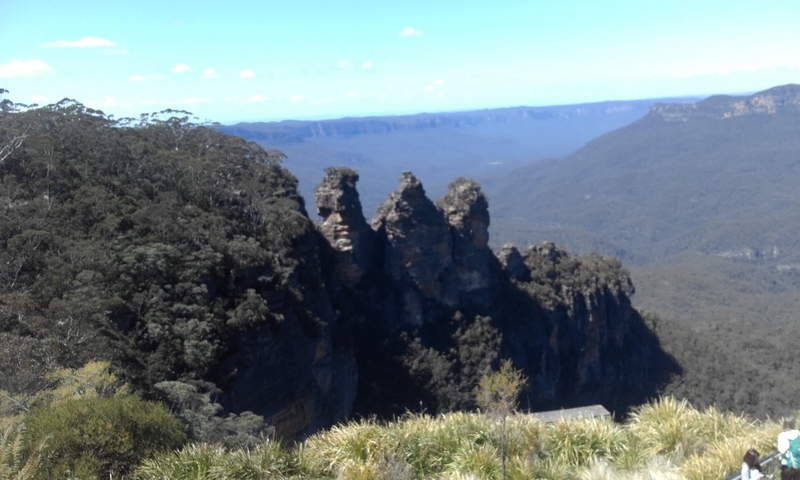 Part 2 of the journey to Katoomba will follow in the next blog!